The 268-year duration of the Qing dynasty was dominated by the rule of two monarchs: the Kangxi Emperor, who reigned from 1662 to 1722, and his grandson, the Qianlong Emperor, who reigned from 1736 to 1796. These two emperors, each of whom reigned for about 60 years, would set the course of Qing history and in large part create the political, economic, and cultural legacy inherited by modern China. For the Manchus, who were a foreign, conquering dynasty, a major task on the road to effective rule in China was that of enlisting the help of the Chinese populace — in particular the elite scholarly class. The man most responsible for accomplishing this was the Kangxi Emperor. First image: Portrait of the Kangxi Emperor as a Young Man, Anonymous, Qing dynasty Hanging scroll; ink and color on silk, 20 x 12 1/2 in. (50.5 x 31.9 cm), © The Palace Museum, Beijing. Second image: Portrait of the Kangxi Emperor in His Library, Anonymous, Qing dynasty, Hanging scroll; ink and color on silk, 54 3/8 x 42 in. (138 x 106.5 cm), © The Palace Museum, Beijing. ** It is interesting to note that the Qianlong Emperor was a contemporary of George Washington (1732-99), who was president of the United States from 1789-97. Qianlong and Washington both died in 1799, at ages 88 and 67, respectively. 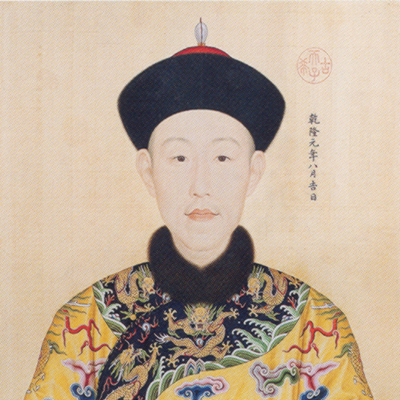 The Kangxi Emperor came to the throne in 1662, when he was only 8 years old. 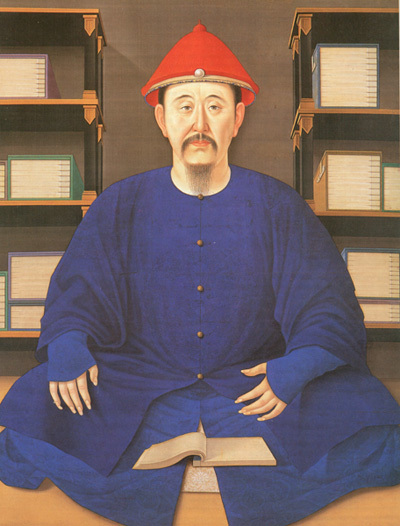 After achieving his independence from several powerful regents, the Kangxi Emperor immediately began to recruit scholars from the Yangzi River delta area, which is called "the South" in China and includes the city of Suzhou. The Kangxi Emperor brought these men into his court to support his cause of transforming the Manchu way of rulership into a truly Confucian establishment based very much on Ming dynasty prototypes. Through this maneuver, the Kangxi Emperor was able to win over the scholarly elite and, more importantly, the Chinese populace at large. The first half of the Kangxi Emperor's rule was devoted to the stabilization of the empire: gaining control over the Manchu hierarchy and suppressing armed rebellions. It was only in the second half of his rule that he would begin to turn his attention to economic prosperity and the patronage of art and culture. The commission of the Southern Inspection Tours (Nanxuntu), a set of twelve mammoth scrolls depicting the emperor's tour route from Beijing to the cultural and economic centers of the South, was one of the Kangxi Emperor's first acts of artistic patronage. The Kangxi Emperor's Southern Inspection Tour, two scrolls of which are featured in this unit, documents his second tour of the South and celebrates his success in winning over the Chinese populace and becoming a true monarch of all China. The imperial inspection tours of the Kangxi and Qianlong emperors were unique in Chinese history. Other emperors in other eras had from time to time completed a single inspection tour of the empire or made the epic journey to Mount Tai to worship Heaven, but the Qing emperors were the first to undertake multiple tours of inspection to all corners of the empire. In fact, these personal inspection tours were part of a strategy for extending and solidifying Manchu rule throughout the empire. In all the Kangxi Emperor completed six southern inspection tours during his 60-year reign; the Kangxi Emperor's grandson, the Qianlong Emperor, followed his example and also completed six southern tours. First image: Inauguration Portraits of Qianlong, the Empress, and the Eleven Imperial Consorts (Detail) 1736, Giuseppe Castiglione (Lang Shining), (Italian, 1688-1766), Handscroll; ink and color on silk, 20 7/8 x 271 in. (52.9 x 688.3 cm), John L. Severance Fund, 1969.31. © The Cleveland Museum of Art. Second image: Portrait of the Qianlong Emperor, Anonymous, Qing dynasty, Hanging scroll; ink and color on silk, © National Palace Museum, Taipei. 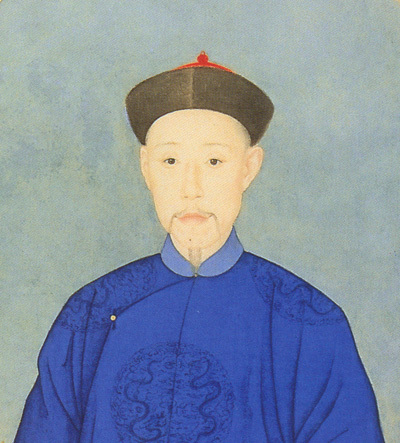 The Qianlong Emperor ruled from 1736 to 1796. 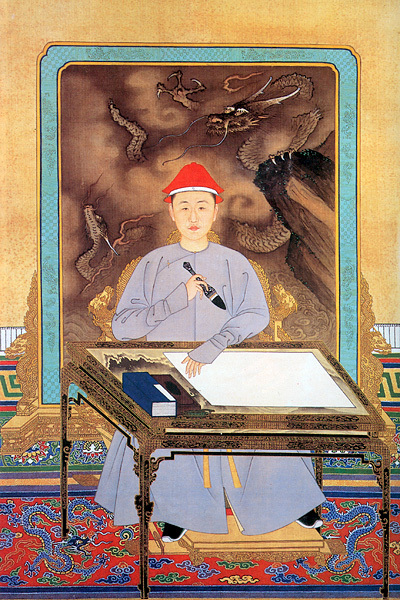 His reign lasted almost exactly as long as that of his grandfather, the Kangxi Emperor, and the Qianlong Emperor further emulated his grandfather by making six epic journeys to the South and commissioning a set of twelve scrolls (also titled Nanxuntu) to document one of his southern inspection tours, just as his grandfather had done. The fourth and sixth scrolls from the Qianlong Emperor's Southern Inspection Tour are featured in this unit. Under the reign of the Qianlong Emperor, the Chinese empire grew to a size unprecedented in Chinese history and included Tibet and a great deal of central Asia, including parts of what are today Russia. In addition, China extended its political control over some of the smaller states in Southeast Asia and Korea. At the height of the Qianlong Emperor's rule, China dominated East Asia militarily, politically, and culturally. In 1912, when the Qing dynasty was overthrown and the Republic of China established, real questions arose as to what constituted "China." At this time many political thinkers and political actors said that "China" was for "the Chinese." Indeed, the Manchu Qing were overthrown partly as a movement of "China for the Chinese." Once the overthrow was accomplished, however, the new leaders had to confront the reality of a much smaller Chinese territory. What followed as a result was a political reevaluation of a consolidated national framework encompassing all the various peoples that had been brought into the Chinese administrative sphere under the Manchu Qing. It is only under the reign of the Qianlong Emperor that the image of a multiethnic Chinese empire began to emerge, comprising not only Han Chinese (the Han constitute the majority ethnic group and the dominant Chinese-language-speaking group in China), but also Mongols, Tibetans, and Manchus, among others, each with their indigenous religious traditions. For example, Tibetan Buddhism, the Manchu shamanistic cult, and the religions of the Mongols (who were largely Tibetan Buddhists as well) were all well supported during the Qianlong Emperor's reign. The Qianlong Emperor as a "Universal Ruler"
The Qianlong Emperor was the first Manchu ruler to not only feel completely at ease with both his Manchu and his Chinese identities, but also to begin to conceive of himself as a "universal ruler." Qianlong deliberately represented himself differently to each of the various constituents that formed his extensive, multiethnic empire. 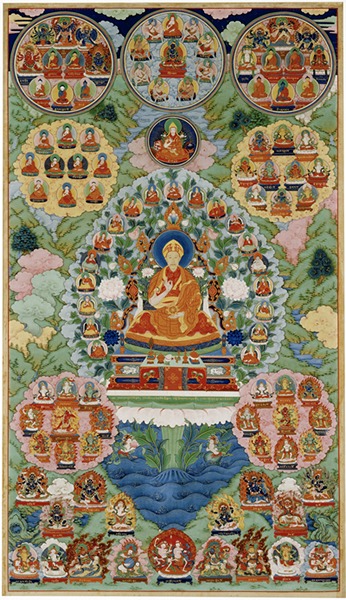 To the Tibetans, for example, Qianlong portrayed himself as a reincarnation of one of the most important bodhisattvas of Tibetan Buddhism, Manjusri; for the Mongols he took on the role of a steppe prince who understood their steppe traditions; and to the Han Chinese he portrayed himself as a scholar and great patron of Chinese learning and art. Interestingly, Qianlong saw himself as the emperor of not only the Han Chinese, the Manchus, and all the other ethnic groups in his empire, but also all beyond the empire. Thus, the contingent of Jesuit missionaries who had come to China during the Kangxi Emperor's reign and still resided in Beijing were often incorporated into the activities of the Qianlong Emperor's court and deemed to be proper subjects of the "Universal Monarch." The Qianlong Emperor's ambitions were all vast in scale. In addition to patronizing the arts, he also commissioned compendia of all the great literary works of the time, and the number of ancient Chinese paintings and artifacts collected during the Qianlong Emperor's reign was unprecedented. The collections of the national palace museums in both Beijing and Taipei were largely formed under the Qianlong Emperor and are the largest repositories of important Chinese artifacts that remain today. 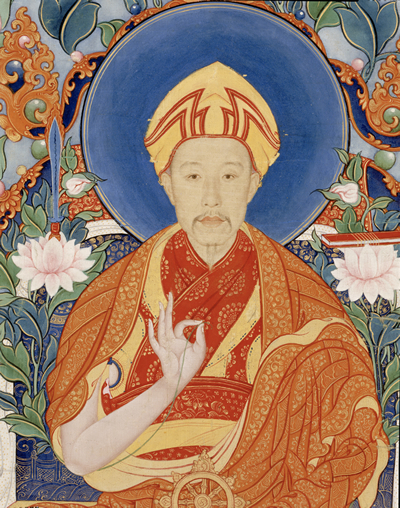 First image: Portrait of the Qianlong Emperor as the Bodhisattva Manjusri (Detail), Qing Imperial Workshop, with face by Giuseppe Castiglione (Lang Shining), (Italian, 1688-1766), Thangka; ink and color on silk, 46.1 x 27 in. ; image: 44.3 x 25.1 in. (118.2 x 69.3 cm; image: 113.6 x 64.3 cm), Purchase, anonymous donor and museum funds, F2000.4, © Freer Gallery of Art, Smithsonian Institution. Second image: Portrait of the Qianlong Emperor as the Bodhisattva Manjusri (Full image) © Freer Gallery of Art, Smithsonian Institution.